Sometimes I feel like I have this whole four-kids-under-five thing under control, and sometimes I feel totally inadequate. Today was a prime example of both sides of that coin. Caroline was at camp, and all the boys were napping this morning. I took advantage of that time to fold some laundry, write a few emails, and unpack a few boxes into the storage closet in the garage (never mind that we moved 8 months ago....). After feeling awfully smug and proud of myself, I came inside to feed Tucker, and a few minutes later heard a loud crash. I rushed to the garage, and there was an entire shelving unit... ripped from the wall, with several serving platters, bowls, canning jars, and 2 boxes of wine glasses shattered on the floor. I was barefoot and holding a baby, so I couldn't properly assess the damage, but rest-assured it is pretty bad. Bright side: at least it wasn't the shelf that hold our china and crystal. Fast forward to this afternoon. I was upstairs getting Smith down for his nap, and I hear both babies crying their little heads off downstairs. I ask Caroline to go sing to them, because that typically calms them down. Except she didn't feel like singing, so instead she stood in front of them and cried and yelled at them to stop crying. And in what I can only assume was a flash of insanity, dumped an entire bag of bath salts over Tucker. Because she thought "he'd think it was funny." He didn't, for the record. After losing my temper and scolding her a bit more than I probably should have (mom of the year), she goes to her room and miraculously falls asleep. She hasn't taken a nap since she was three years old, so this was huge. And Smith was asleep. And then there were two. The twins fought it for a while, but eventually fell asleep as well. By this point it was after 4 pm, so I thought it only appropriate to open a beer and relax on the screen porch to celebrate all four kids napping simultaneously. Fifteen minutes later, the twins woke up, my respite was over, and it was back to the daily grind. It was fun while it lasted though. Frustration, happiness, inadequacy, and gratitude are pretty much the emotions that I cycle through every day, every week. I vaguely recall the day I first made these eggs as a "frustration" day. I don't remember the specifics, but I do remember it culminating in Joey pacing with crying, hungry baby in the kitchen while Smith and Caroline were hungry and underfoot, and me rushing to get dinner on the table. I'm pretty positive that I either wolfed down my food way too fast or reheated it in the microwave after feeding said hungry babies, but I do remember us loving this meal. It seems so elegant and fancy, but it comes together in less time than it takes to calm a crying baby. I have since made this a few times, and it remains a favorite. You start by making a compound butter using porcini mushrooms, then use that to scramble eggs. It's also slathered on some toast to serve alongside the eggs, and I can think of several other capacities in which it'd be pretty fabulous. 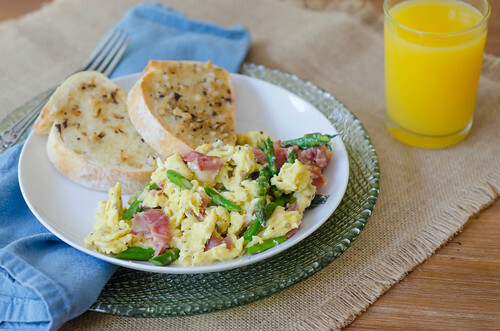 Asparagus and prosciutto are folded into the scrambled eggs, and there you have it. A quick and easy meal that would be worthy of a restaurant. It makes a great dinner, lunch, or weekend brunch - which is my personal preference. Mimosas are optional. Season sparingly along the way, as the prosciutto and Parmesan are both quite salty. Ere on the side of under seasoning, then adjust accordingly once everything is mixed together at the end. Preheat the broiler or toaster oven. Combine the mushrooms and water in a microwave-safe bowl and microwave about 1 minute, or until steaming. Set aside for about 5 minutes, or until softened. Use a fork to lift the mushrooms from the water, pat dry with a paper towel, and mince. Mash the mushrooms into the butter with the shallot, and season with salt and pepper to taste. Meanwhile, heat the oil in a 12-inch nonstick skillet over medium heat. Add the asparagus and cook until lightly browned, 2-4 minutes. Transfer to a plate and set aside. Whisk the eggs, half and half (or milk), salt, and pepper together in a large bowl until thoroughly combined and the color is pure yellow. Spread 3 tablespoons of the butter over the bread and toast to your liking. Melt the remaining tablespoon in the now-empty skillet over medium heat. Add the egg mixture and, using a heat-proof rubber spatula, constantly and firmly scrape along the bottom and sides of the skillet until the eggs begin to clump and the spatula leaves a trail along the bottom of the pan, 2-3 minutes. Remove from heat and fold in the asparagus, Parmesan, and prosciutto. Continue to stir the mixture until the eggs cooked through, another 30 seconds or so. Taste and season with additional salt and pepper as needed. Divide the eggs among plates and serve with the buttered toast. I don't know how you do it all Josie! I'm exhausted just thinking about caring for myself and 4 kids all day long, nevermind getting blog posts up on top of that :) I've got to try this - that porcini butter sounds heavenly. This egg dish looks pretty incredible, too. What an awesome meal to throw together when you need a little indulgence during a stressful, busy day! You deserve mom-of-the-year award for all those kiddos! I can't even imagine. This meal sounds perfect for one of those crazy days. Easy and so tasty.